Putting the 'how' and 'why' questions aside, Julia Gillard has made history. After 26 male incumbents, Australia now has one female prime minister. It is heartening to know that women have now broken down almost every barrier to full participation in national life. Gillard will recognise her debt to the many women who achieved steps along the way to the top political job: those who persevered to win party endorsements as candidates, to survive as backbenchers as small minorities and to perform admirably in ministerial roles, have made the tasks of those coming after them a little easier. All Australian women have cause to celebrate this victory. But the celebrations over Gillard's achievement cannot go on forever. She will be the first to recognise that she now has to get on with the job of restoring public confidence in the Government. While she will be remembered forever as the first woman to become Australian prime minister, Gillard will also seek to be remembered as one of the finest. If electing a woman to the top job is to remain important, then Gillard needs to imbue her performance with some unique qualities. She has the opportunity to demonstrate something special in both political style and policy substance. A good deal has been written about Rudd's abrasive style. Critics found him verbose and consequently remote from ordinary people. They also remarked on his tendency to claim the moral high ground in a manner that appeared rather puritanical. His statements on the fates of the Bali bombers and photographs of young girls seemed to be unnecessarily severe. In this regard he resembled his Liberal predecessor closely, and his victory speech after the 2007 election was ominously reminiscent of John Howard's in 1996. It is difficult to attribute the Government's apparent loss of popularity wholly to Rudd's leadership, but claims that an inner circle of a few senior ministers and youthful advisers dominated policy suggest that he was seen as dictatorial. 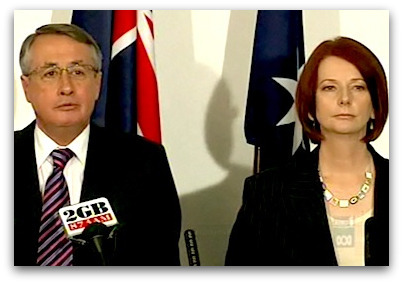 Clearly, Gillard and her deputy Wayne Swan will ignore these criticisms at their peril. They were part of the small team Rudd headed so it is difficult for outsiders to appreciate how they can distance themselves from Rudd's legacy. There needs to be more consensus style, but at the same time, they need to make some firm decisions and end impressions that the Government is afraid to move against the wishes of the middle ground. On his last night as prime minister, Rudd claimed he rejected the advice of some who wanted to move the party 'to the right' on asylum seekers. It is not clear whether he was suggesting that Gillard's supporters wanted such a hardening of policy. What is clear is that the Government's approach to this issue has been very disappointing. Rudd did too little, too late to stop the rightward drift. It is a pity that the man who officiated at the Apology to Stolen Generations did not maintain the high standard he set for himself before parliament resumed in 2008. The policy that seems to have broken Rudd's hold on power is the mining super profits tax. It is probably a sign of how timid Labor Governments have become that they have to justify taxation policies to special interests. It is an argument of last resort to claim that a specific tax will be used to fund hospitals and schools. Surely if there is any vestige of democratic socialism left within the Labor spirit, then the Gillard Government needs to raise taxes without apology, knowing that its social welfare policies are both just and necessary. It also needs to remain committed to redistributing national wealth in such a way that huge discrepancies in living standards and opportunities are eliminated. It seems likely that Gillard will lead Labor to victory in the coming election. If she does then she will set another record. But she is not likely to be content with symbolic achievements. The broader Australian community will be grateful to her if she uses her position to build on Rudd's achievements while distancing herself more firmly from Coalition policies such as mandatory of detention of asylum seekers, the military commitment in Afghanistan, inaction on climate change and income quarantining for Indigenous people. Some are complaining loudly over the factional wheeling and dealing involved. I for one would rather see the Government influenced by the unions than by the Melbourne Club. Not all Australian women have caude to celebrate Julia Gillard's victory. My 3 adult daughters are not happy that our new Prime Minister is Pro-Abortion. We will definetely vote for Tony Abbot, he is Pro-Life, loyal Catholic and he is not a hypocite bleeding heart do-gooder. He is a compassionate man doing good work for the cmmunity. Where is the social justice when we let governments to allow the torture and killing of thousands of Australian Unborn Children? I would have thought that you would have to know a bit about politics and economics to obtain a PhD in political science.Dr Smith clearly knows very little. It seems to have escaped his attention that this govt has squandered billions of dollars of taxpayers money on it's failed pink bats scheme and serial rorting in the schools building program.Add to that the fact that state labour govts have squandered their GST windfall on bloating their beauracracies rather than putting that money into hospitals and schools. This govt cannot manage the taxpayer funds it currently receives.Any argument that taxation should be increased is unsustainable. Judging from the feedback on Tony Smith's article he has written on the least popular aspect of the Gillard takeover. What difference will it make to social justice issues? I consider it one of the most important questions. In the world of oppositional politics surely if a democratic socialist party stands for anything it is a fair and equitable distribution of the nation's wealth. But it would seem most feedback was concerned with those populist issues which were given more space than they deserved in the tabloid press. And the broadsheets were not much better. I found the title of Moira Rayner's article "It's a girl" ironic in view of Kristine Keneally's disclaimer: "I'm nobody's girl!" when accused of being in thrall to the heavies of the NSW Right. Survivors of the Indian Residential Schools who testified to the Truth and Reconciliation Commission complained of shocking treatment, violence and sexual abuse. Testimonies left no doubt that Canada's churches were heavily culpable. I don't know about you, but last time I got on an outrageously late, over-crowded train at peak hour full of apparently longstanding Aussies in business suits, the first thing I thought was: I really wish Australia accepted fewer immigrants.